Up until early last year, if you asked me about the Essex food scene, or rather, the Essex restaurant scene; to my eternal shame, I probably wouldn't had that much of an opinion. I could have banged on about my local ockabasi or favourite Thai restaurant maybe, plus a couple of decent pubs here and there. But the truth is, I never really use to eat out that much in God's Own County. I much prefer to head into the bright lights of the city, or that there London you see. When I can afford it that is. Then I got a gig, doing some reviewing and writing for a quarterly lifestyle magazine called 'Exquisite Essex' and was suddenly plunged, head first, into the deep end. This was all new to me but I soon found out that the nature of magazine publishing was largely based on doing things at the last minute. For my first edition, I visited twelve restaurants in the space of about three weeks and I am sure some seasoned pros and bloggers reading this will scoff at this. However, that is still a lot. Three courses of rather extravagant food will keep you going all day, I quickly discovered. Especially if I went for lunch. If I went for dinner, I was doomed. Because I'd often forget and casually snack throughout the day before remembering I had an appointment in the evening and scarpering off. Ooof. Nurse! You live and learn. But the point I am trying to make is that, by and large, we do have some cracking places in Essex to eat out. And I can now gladly list a proper top five...or top ten even, with these old sausage fingers of mine. 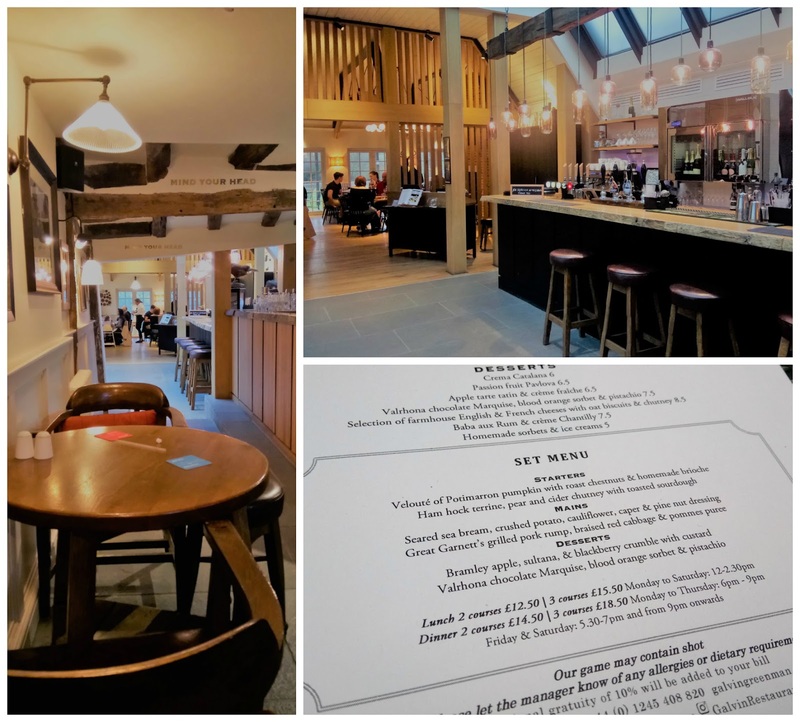 Come to me for ideas and I will thoroughly recommend The Anchor, in Hullbridge; The Star Inn, in Ingatestone; and The White Hart, in Great Yeldham. Although that last one is practically in Suffolk. Oh and another one to watch is Andi Walker's revamp of the Riverside Inn, opening very soon. To add to the growing list is the Galvin Green Man, a restaurant and pub, situated in Howe St, just outside of Chelmsford. You may well have recognised by the name, that this pub is connected to the Michelin starred Galvin Brothers. Or Chris and Jeff, as I like to call them. So, with that name comes quite a pedigree and I have been wanting to visit their latest outpost of their empire, back in their homeland, for some time now. We arrived with my in-laws in tow for lunch and specifically, whenever the father-in-law is invited anywhere, there is always the danger that we have brought him to some place 'poncy'. But even he was soon bowled over by the whole ambiance and put at ease by the swift arrival of a pint of Adnams, all delivered with a warm smile. The good start carried on, when our waitress brought some home-baked bread for us to nibble on, whilst we looked through the menu. As Mrs FU and I were paying for the meal by way of a belated Christmas treat, we ushered her parents straight towards the set menu at the bottom of the page. And before you call me a cheapskate, it's January. The kids have cleared us right out and we have just about enough bread and dripping to see us out till payday. Besides, I always feel you should be confident that any restaurant worth it's salt, will deliver a decent two or three course, with a more than palatable house wine, Because if it all falls apart at that first hurdle, then gawd only knows what the a la carte will be like. You hear me? Fine. So, a handsome ham hock terrine, with pear and cider chutney, and steaming bowl of pumpkin veloute with chestnut appeared quite promptly after ordering. A little too promptly maybe, but given that we were all starving (or at least I was, I've been eating nothing but bread and dripping remember) it didn't matter too much. And anyway, both dishes were great. Really good examples of showing what you can do with some simple ingredients and more than just a touch of skill. The terrine was rather elegant actually, with a nice amount of delicate liver coursing through and we all cooed over the cosseting nature of the soup. Squasheses are not just for Autumn you know. Next up, came two really big, hearty plates of food. A generous fillet of sea bream, with crushed potato and a cauliflower, pine nut and caper dressing, enjoyed singularly by my mother-in-law (we were allowed a small bite each). As for the rest of us, we all laid waste to some amazing pork rump, sourced from Great Garnett's Farm in Dunmow, which is just down the road. Served with a silky pomme puree and meaty, ambrosial jus, it was...bloody hell, it was amazing. Quite possibly brined and then lightly smoked before grilling, it was the best, most succulent pork I have had in a long time. Even the reddened bark of the skin was tender and yielding. As opposed to the usual chew. Outstanding, really outstanding. And we ordered some more bread to mop up the gravy. So uncouth. Our desserts hit top marks too. A stalwart in the form of bramley apple and blackberry crumble, and an indulgent Marquise, served with blood orange sorbet and candied pistachio. Again, no small or meager offerings were to be found here. If you order the crumble, do not drive. Not that it is alcoholic in any way. It is just so comforting and soothing, you may well need to have a quick lie down afterwards (there are sofas in the pub). One slight trip up was the chocolate skid mark to accompany the slab of rich chocolate and sharp quenelle. It really is unnecessary, does nothing to enhance a plate and is not befitting of a noblewoman such as myself. But the overall combination of flavours was pretty damn perfect and I really liked all the other additions. Some micro herbs here (lemon balm?) and a small cracked pile of caramel there. So all was forgiven. Just. The cost of these three courses came to the princely sum of £15.50 a head - plus extra for wine and more beer (I wasn't that stingy). Which, given what we ate and the quality, was astounding. I think, perhaps, this is what impressed me most about the Galvin Green Man. At its very heart, it is still a pub after all and there is evidence throughout the venue, of an aim to bring about a community spirit though other special deals. They do cinema nights, with the offer of a burger and a pint for £10. Burns Night is looking like five courses for a very reasonable £35. That romantic devil, Fred Sirieix, is even turning up for a book signing soon. £32 for a two course lunch, a copy of his new book 'Secret Service' and the chance to gaze into those blue eyes of his. Once more, not bad. OK, we are are edging into territory that is over and beyond your usual village pub programme of events. And you can go all out in there, most definitely. As we sat and ate, the restaurant filled up quite quickly and I remember enviously spying a platter loaded with some beautiful looking Cote de Boeuf, heading off into the distance. So when this month is over, we must return for a splurge and when the kids will have also got their jobs sweeping chimneys and selling matchsticks. It's all lined up. But in the meantime, I will happily and regularly return to Galvin Green Man. To take them up on that set menu of theirs, to appreciate the friendly service and while away an hour or three in the bar. Yep, I am definitely adding the Galvin Green Man to my newly expanding file of 'Essex Restaurants Wot I Really Like'. And the way things are going, I am going to need some extra fingers.